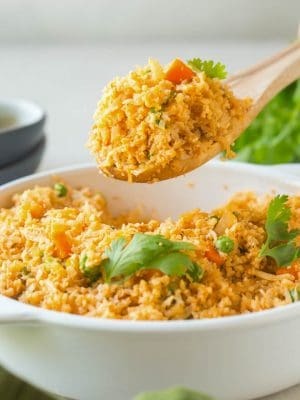 Learn how to make cauliflower rice with this simple Mexican cauliflower rice recipe. This easy cauliflower recipe cooks in less than 20 minutes and is packed with fresh flavor. 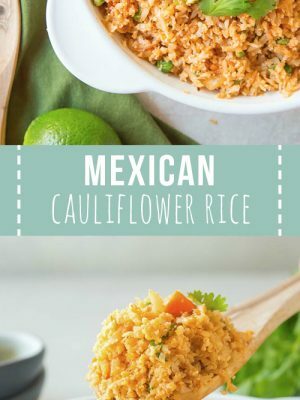 Mexican cauliflower rice is one of my favorite side dishes. 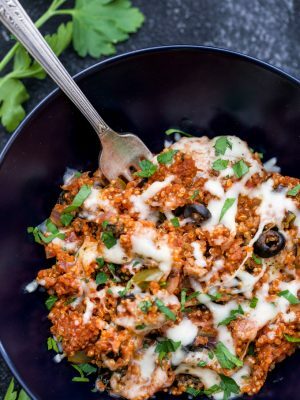 It’s easy to make in less than 20 minutes and is a great low carb alternative to traditional rice or quinoa. 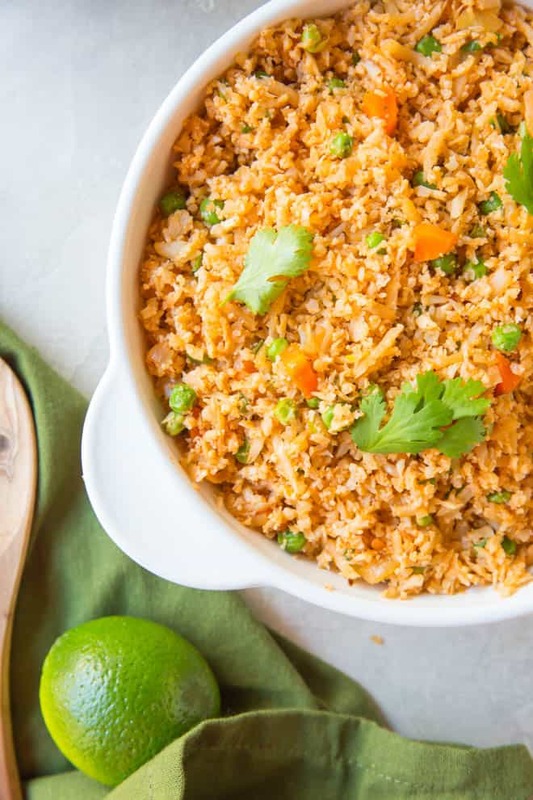 We love serving this rice with simple grilled chicken or on the side of a stir fry recipe like cilantro lime chicken teriyaki stir fry. Switch out the quinoa in these cilantro lime shrimp quinoa bowls for a tasty low carb alternative. 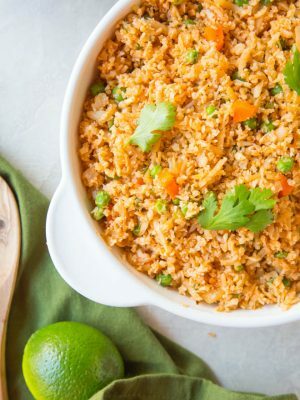 This Mexican cauliflower rice recipe even tastes great on its own. 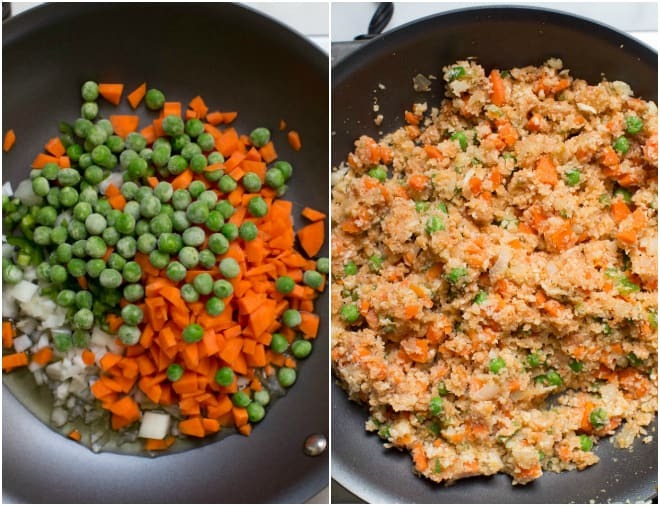 Cauliflower rice is a simple side dish that is so easy to make. 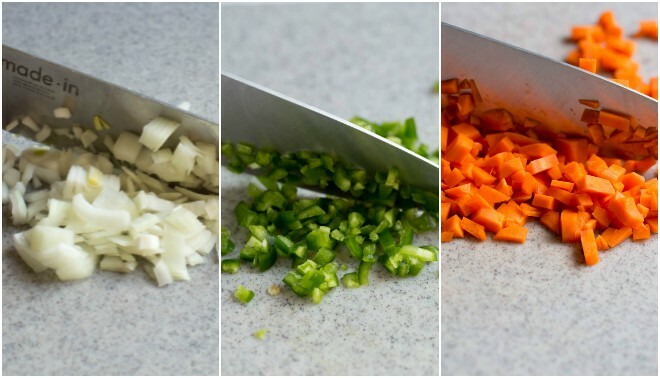 Learn how to rice cauliflower in a few simple steps. Chop one head of cauliflower into florets. Add the florets to a food processor or chopped. We love using this large KitchenAid food processor because it’s easy to use and clean. Puree the cauliflower into small pieces (about the size of rice). You can puree larger or smaller pieces, depending on your preference, but you may need to adjust the cook time. After the cauliflower is pureed into small pieces, add olive oil to a nonstick skillet over medium heat. Sauté the cauliflower with the olive oil. Add additional ingredients like tomato sauce and spices such as cumin or chili powder, if desired. Cook until the rice pieces are cooked through and all of the ingredients are combined, about two to three minutes. 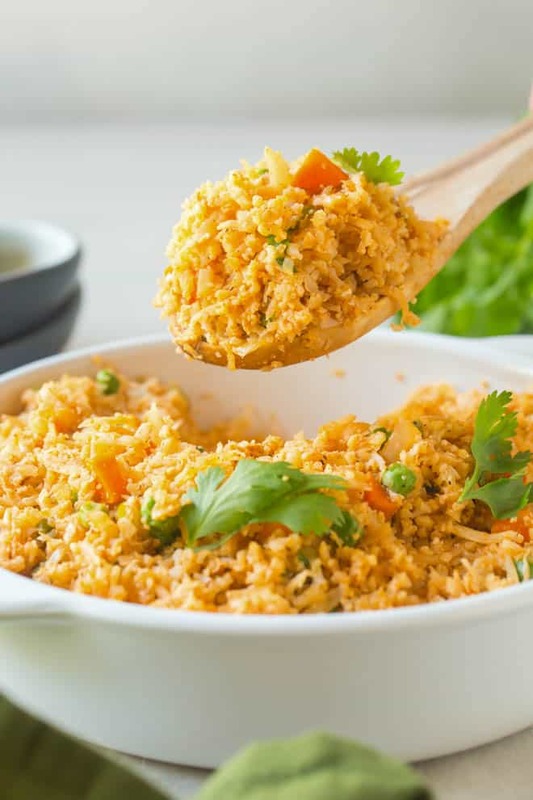 To make Mexican Cauliflower Rice, follow the full recipe below. 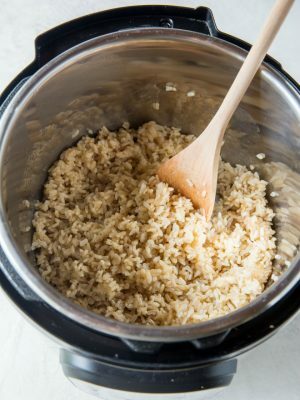 You can also use the bagged cauliflower rice at the store instead of processing a head of cauliflower. The bagged cauliflower rice is generally located in the freezer section. If frozen, you may need to cook the rice slightly longer. Cut the onion, jalapeño and carrot very small. You don’t want large chunks of vegetables in the rice. Cook the rice over medium heat and use a nonstick pan to prevent burning. A little bit of seasoning goes a long way. For this entire recipe, we use 1/4 cup tomato sauce and less than 3 teaspoons of seasoning. Too much seasoning or sauce will weigh down your rice. 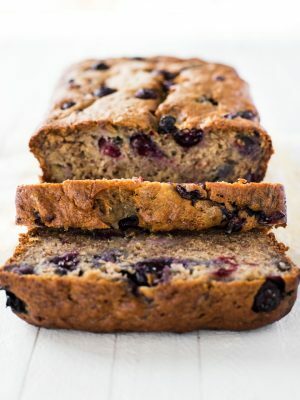 Keep it nice and fluffy by using a few simple ingredients. 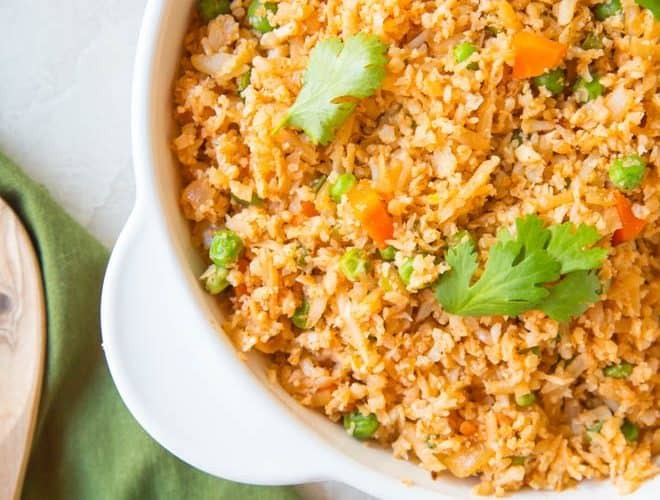 Store leftover rice in the refrigerator for up to 3 days. 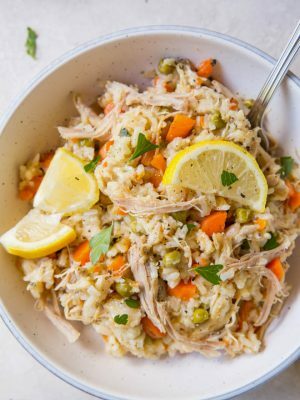 This tastes great as leftovers! Cauliflower is a low carb alternative to standard rice. If you’re cutting carbs, cauliflower rice is a great choice. 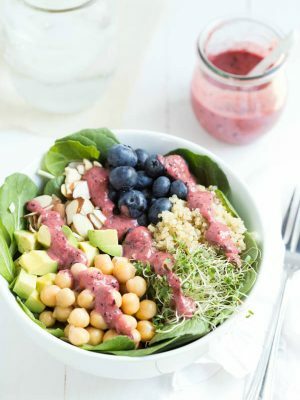 It’s low in calories but high in nutrients and vitamins. 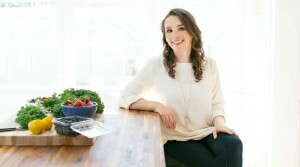 This cauliflower rice recipe is paleo. Cauliflower rice is gluten free. Cauliflower rice is dairy free. 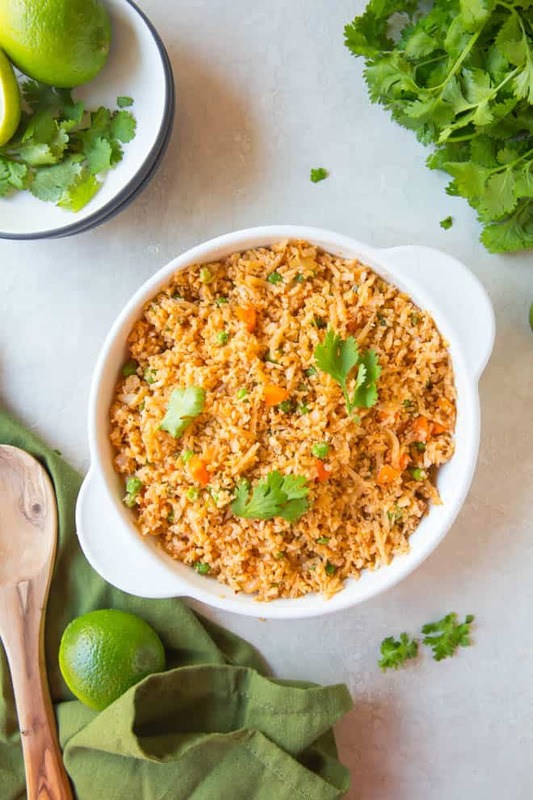 Learn how to make cauliflower rice with this simple Mexican cauliflower rice recipe. This easy cauliflower recipe is quick and tastes so good. Heat olive oil in a large nonstick skillet. Add the onion, jalapeño, carrots and peas and stir fry until the onion is translucent, about 2 to 3 minutes. Add the riced cauliflower and garlic and cook 3 to 4 minutes until tender. Add tomato sauce, salt, cumin, paprika and black pepper to the pan. Stir well and cook for 1 minute until heated through. Remove from heat and stir in the chopped cilantro. 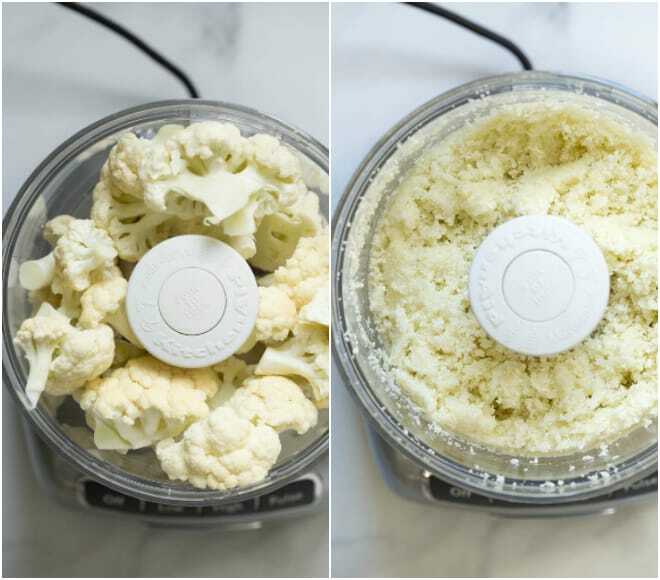 Use a food processor or chopper to rice the cauliflower. You can adjust the size of the rice, depending on your taste. To make it spicier, add an additional jalapeño or add hot sauce, to taste. Store in a sealed container in the refrigerator for up to 3 days. 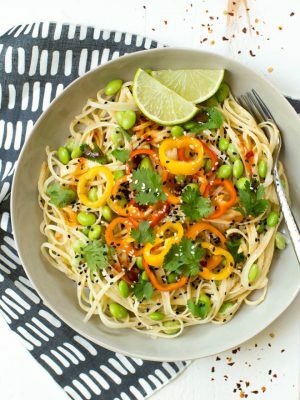 If you try this recipe, don’t forget to leave a review and comment below. 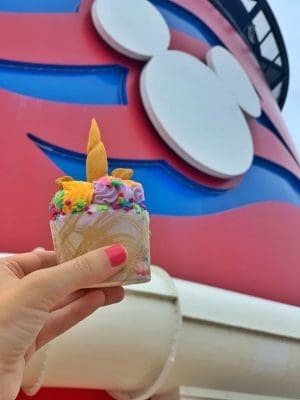 Your feedback helps us create high quality recipes!